Breed Group: Hounds Weight: 6-8kgs Height: 30-32 cms Color(s): any true hound color (tricolor) Coat: Beagles have a very sleek and shorthaired coat. The Beagle has a hound type coat of medium length making grooming relatively easy for this breed. 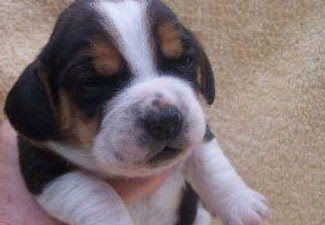 Distinct feature: The Beagle is full of energy and does great in a family environment. They are very lively, active, and high energy making a wonderful childs companion given the proper socialization. This breed is alert and of even temperament and should never show signs of aggression or timidity. Temperament: The Beagle is an all around happy dog that makes a wonderful companion for many different families. This breed adapts to many different environments and lifestyles, if not all. The Beagle is very eager to please, and is very intelligent however training must be consistent as this breed tends to lose interest and focus on something that catches his attention. This breed does extremely well with children, and can do exceptionally well with other pets if socialized properly. Activity: The The Beagle is fairly active and loves long and vigorous walks.Large Dog Breed Bull Mastiff .. English Mastiff ..French Mastiff.. Neopolitan Mastiff ..Great Dane.. St.BernardMedium Dog BreedAustralian Sheperd ..Beauceron..Belgium Shepherd.. Boxer..Chow Chow..Dalmatian..Dobermann.. German Shepherd..Golden Retriever..Grey Hound..Irish Setter..Labrador Retriever.. New foundland..Pointer.. Rajyapalam..Rottweiler.. Rough Coolie..Siberian Husky..SMALL DOG BREED Basset Hound..Beagle.. Bichon Fries..Bull Dog – English ..FrenchBull Terrier.. Chihuahua..Cocker Spaniel..Dachshund..Jack RusselTerrier..Lhasa Apso..Maltese.. Miniature Pinscher.. Pekingese..Pit Bullterrier..Pomeranian..Poodle..Pug..Samoyed..Scottish Terrier..Shih-Tzu..Tibetan Spaniel..Yorkshire Terrier..